Hang onto yr improv hats should be a great evenings free playing…. Phil Marks is renowed for his unique approach to the drumkit playing regularily with Stephen Grew in the ‘Grew Trio’ who joins him tonight on synthesizer. 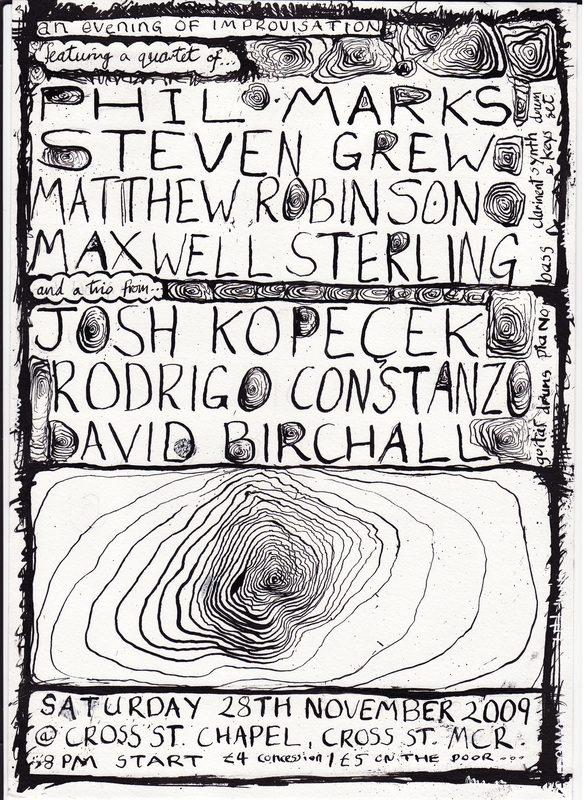 Phil also recently performed with Evan Parker at the Cross Street Chapel where this saturdays gig also takes place. They are joined by bassist and clarient player Matthew Robinson and Maxwell Sterling who laid down some quality ECM/old skool free jazz type stylings when I saw them in Lancaster recently. Should be something to special! This quartet are joined for a first performance from a Manchester based trio, comprised of composers/improvisers serious thinkers Josh Kopeçek and Rodrigo Constanzo on piano and percussion respectively. They are joined by your good author wrestling with and dropping things on top of the guitar. Should be a great evening from soem of the most innovative musicians in the North West!